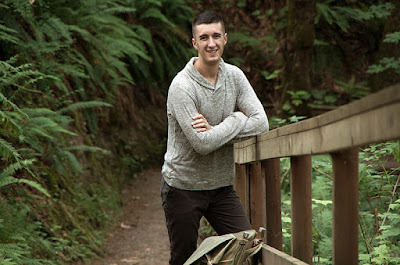 I'm proud to announce that we have the newest patterns from Thread Theory Design Inc. Based out of British Colombia, Canada, the husband and wife duo of Morgan and Matthew, create a line of men's clothing patterns. There is a definite void of men's patterns in the sewing world and thankfully they help fill part of the void. I interviewed Morgan last summer during the 'In the Studio' series. We are now carrying the Finlayson Sweater, Jutland Pant and the Camas Blouse (which is a women's pattern). Men can be picky about their handmade garments. They don't want them to look too handmade. They need to be just right! There are a lot of factors to consider -- techniques used to make it look store-bought, ease of use and fabrics. I think the hardest part can be selecting the right fabrics. Men's clothing is so much plainer than women's clothing and a bit more rugged. I took a look through my husband's closet and I found - medium-heavy weight pants fabric such as cotton twill, polyester/rayon blends (for dress pants) and denim. None of his pants had stretch like there is in women's clothes. He has a number of buttondown shirts for work, which are mostly cotton or cotton/polyester blends. On to the knits in his closet -- mostly the performance knits such as the fabric used in golf polo shirts. Then of course the basic t-shirt knit that usually doesn't have stretch (or lycra) and is more of an interlock or heavier jersey. And lastly, fleece, sweatshirt fleece and flannel finished off the list. The Finlayson Sweater is a grown-up version of your typical hoodie. For this pattern you want find medium-heavy weight knits such as heavy interlock, heavy slub knit, lightweight sweatshirt fleece, french terry or any other medium-heavy knit. If you're lucky enough to find a matching rib knit, that would be suitable for the cuffs and hem. 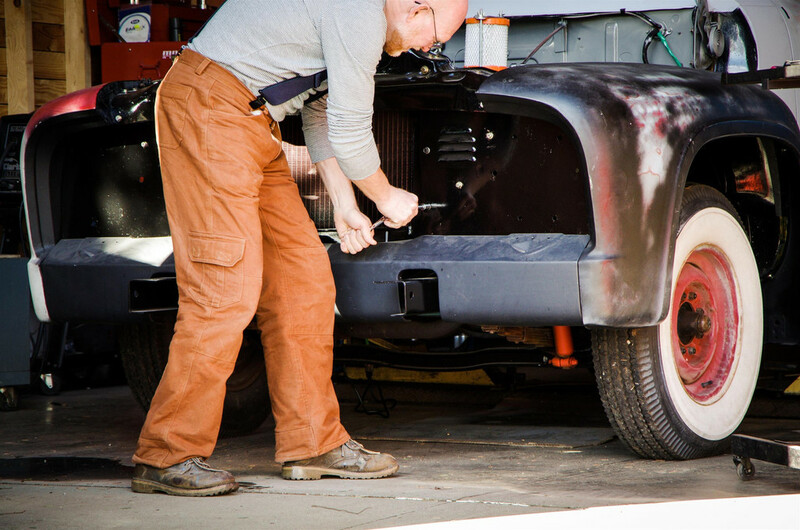 The Jutland Pant is a casual work or hiking pant or classic denim pant. Omit the cargo pockets and create a more dressy pant to wear to the office. It also includes a variety of features that make it suitable for hiking or more rugged use such as hem and knee reinforcement, an optional lining for uncomfortable waterproof fabrics and more. For a casual look, use pant weight fabrics such as denim, twill and other cotton and synthetic bottomweights. For a dressier look, use heavier suiting fabrics in wool, cotton, or polyester blends. I wouldn't recommend light weight suiting fabrics because it may look sloppy on a pattern that is slated for heavier fabrics. For those of you that don't want to sew for men or your man is picky and doesn't want to be sewn for, they have come out with the Camas Blouse. This pattern is to be made from knit fabrics. The intent is to have a comfortable shirt that feels like a t-shirt, but looks better than a t-shirt. The recommended fabrics include lightweight stretch knits such as rayon, silk, modal, cotton or bamboo jersey. We always have a great selection of jersey knits which you can check out HERE. When selecting the fabrics to use in these men's patterns, look at men's clothing like I did. I would never use an ITY knit for my husband's shirts. Nor would I use a ponte knit for them. If they look like a women's fabric and you've never seen them in men's clothing, don't use them. Stick with cotton and blend knits in various light-medium to medium-heavy weight. Don't pick tissue or really like jerseys. It is too light for men. For bottoms, pick heavier fabrics (at least for Thread Theory patterns). If you're going to make more professional, office garments, then you may consider lighter weight suitings such as tropical weights or rayon blend suitings. And of course shirting fabric for buttondown shirts. We carry entire Thread Theory Design Inc. pattern line. Check them out HERE. And don't forget, Father's Day is around the corner and what better gift to give is a handmade gift! Have you ever sewed for the men in your life? How is sewing for men different than women? Do you have any suggestions for our readers? When the latest release of Vogue Patterns was posted, I was immediately drawn to this one- Vogue 9104. The two tone soft wave effect reminded me of an ice cream sundae, an ocean wave, a sand dune. Ahh- just so organic and relaxing. I just couldn't wait to make it. The only question was what fabric to use? 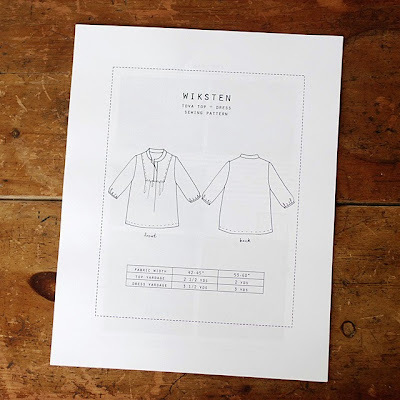 The pattern suggested crepe de chine, broadcloth or jersey. I chose two rayon jerseys from Fabric Mart, and ordered 3 yards of each color. The fabric shrunk quite a bit after the first washing, and I was left with 2-1/2 yards of each. That sounds like a lot of fabric, but the dress really took the entire length of it. I do have some bits and pieces left that I'm hoping to piece together another top. Rayon jerseys have many pluses- they drape beautifully, they are extremely soft and silky to the touch, and are breathable. 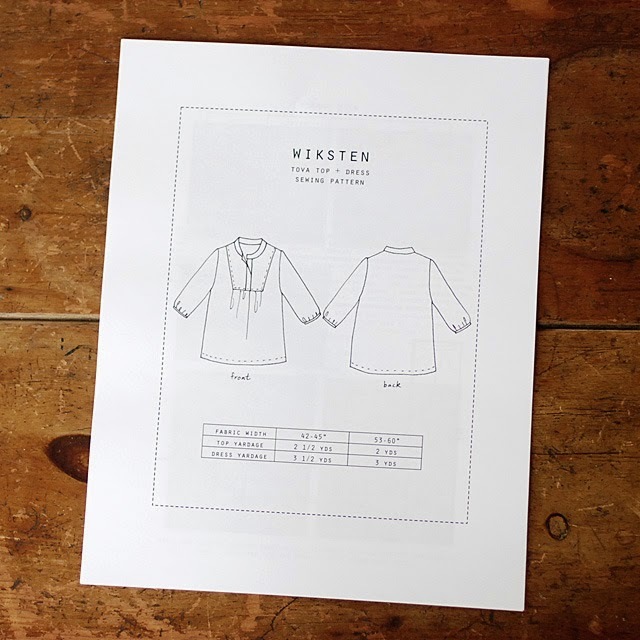 On the minus side- they tend to grow longer as the day goes on, so you have to do something to stabilize areas like necklines and armholes, and you need to adjust the overall length. So, for this dress, I first folded out about 4" of length from the pattern before cutting. I removed 1" across the chest, so that it would shorten the armhole length. 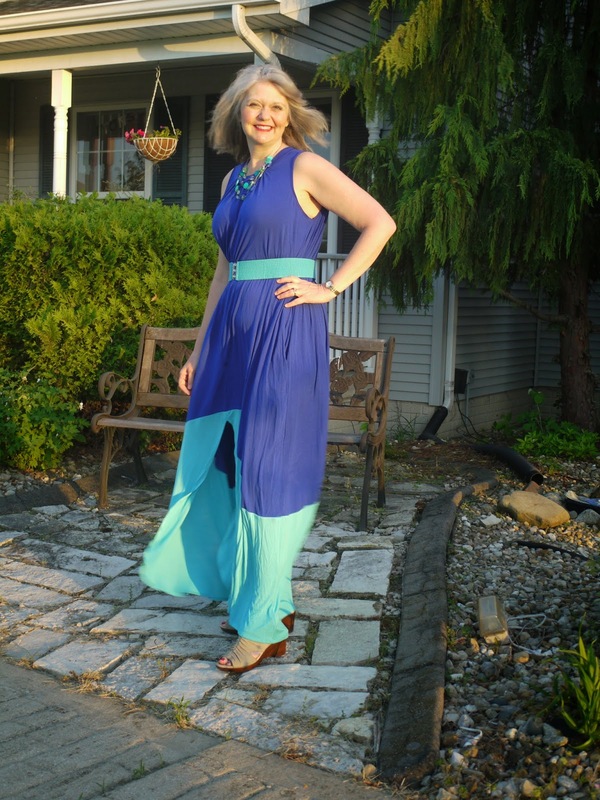 I removed 2" in the main body at the shorten/length line, and I removed 1" at the lower layer hemline. I'm 5' 9" and if I made this out of a woven fabric, I would have added about 3" in length, so removing 4" gives you an idea of just how much a rayon jersey will grow. I'm even wearing 3" heels in these photos! To stabilize the armhole area, I adhered a 1cm strip of fusible interfacing around the seam line of the armhole when it was flat. Then, instead of a facing, I just turned under the raw edges and stitched in place. The fusible interfacing keeps the armhole from lengthening. Very important if you don't want to show your bra. 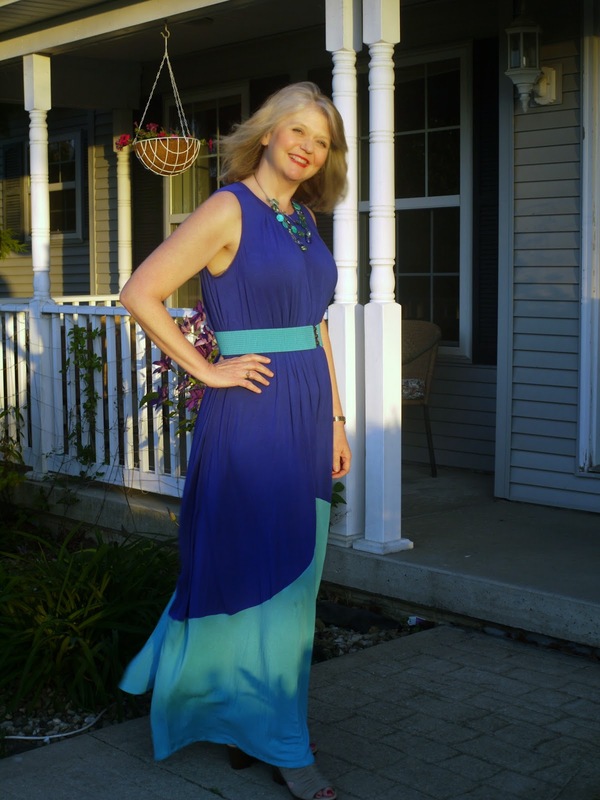 The other change that I made to the pattern was that I chose to simplify the neckline. It is designed for an interfaced neckband and a loop and button closure in the back. I skipped the interfacing, and just sewed the band in a circle, so that I can pull this over my head. I actually tried it on before adding the bottom layer, and it looked good, so this pattern could easily be a shorter dress, just by removing the lower piece. 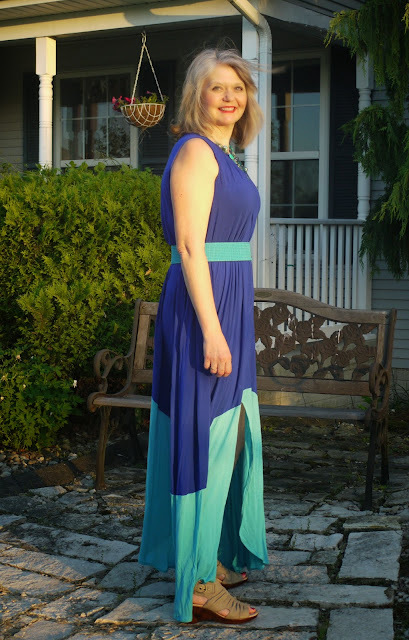 The dress has in-seam pockets as well. Thank you, Vogue! I love a dress with pockets! We took these pictures on a windy day- the skirt would normally hang straight down, but I kind of like the dramatic effect the wind has on it. Made from a light weight knit, this is almost a one size fits all dress. I say "almost" because of the length. 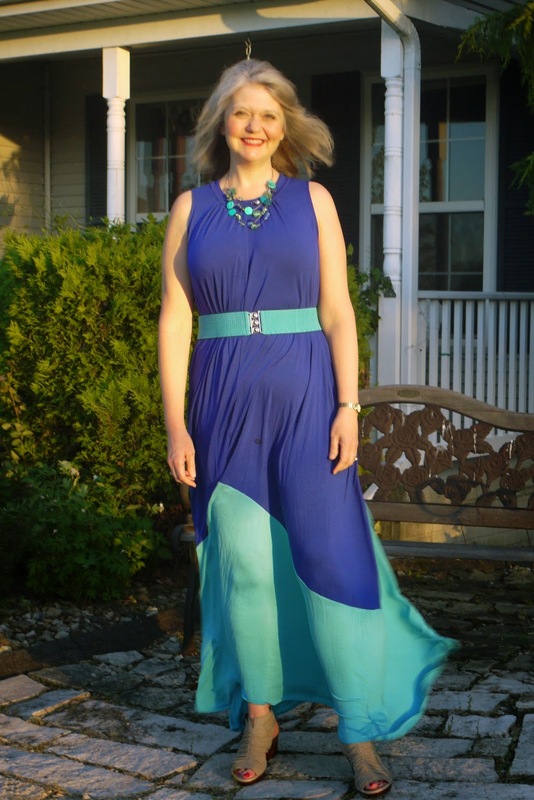 But if you are wearing a belt, you can pull up the extra length and blouse it over the belt. I made this to wear to my daughter's college graduation party. It was comfortable and everyone loved it. I hope that I'll have more occasions to wear it this summer. It seems a little dressy for every day wear, but honestly, it is so comfortable that it feels like I'm wearing pajamas. It would be fun to make this from some other color combinations. Can you see it in black and white? Or how about orange and grey? Or burgundy and lavender? So many possibilities! Alas, one of this style is enough for me, so I will have to wait to see what other people make and enjoy. Hello! I'm glad to be back on the Fabric Mart blog and joining the other Fabricistas with a new summer project for May. Well, I may have been one of the few people on the sewing planet that hadn't made Wiksten's Tova Tunic, but folks things have finally changed. I'm bringing summer in with a sunny sunburst Tova. There are plenty of reviews of the Tova tunic out there so there's no need for me to review it here. But I will say although the blouse has simple lines and lends itself to all types of fabrics and embellishments, I wouldn't recommend it for a beginner. It's a seasonless pattern and would be a great project for an intermediate sewer. Some time ago I pinned a Steven Alan shirt onto my I Wanna Make This Pinterest board because I loved the fabric. Eureka! I found it! 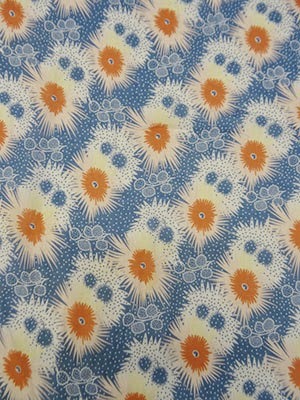 Fabric Mart's abstract bursts 100% lightweight handkerchief linen in white, blue and pale coral is just that fabric! This linen is lighter than any other I've ever worked with but still is crisp like other linens. I machine washed and dried it before I cut it out and it came out lovely. The colors are beautiful in this fabric and I decided to highlight the coral on the bib of the tunic using embroidery thread and my sewing machine. 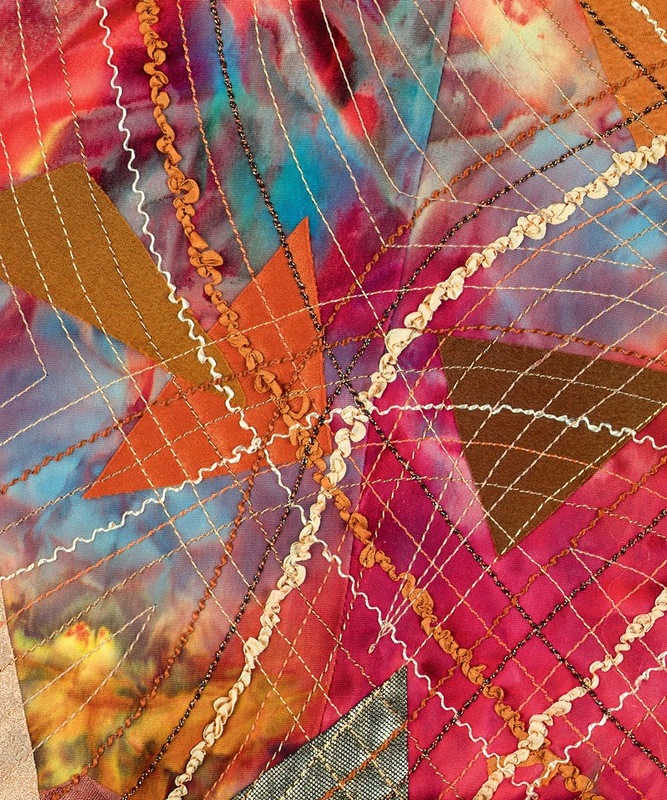 Reverse bobbin work is popular among art quilters but I don't often see it anywhere else. 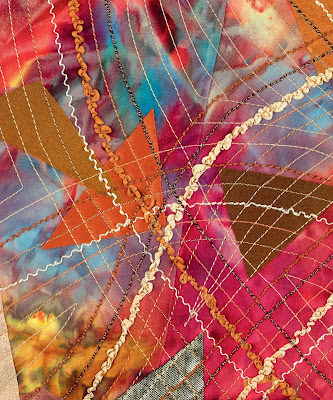 Quilters take decorative threads that don't fit through sewing machine needles and wind them on the bobbin instead. When you sew from the wrong side, the decorative thread from the bobbin shows through on the right side. For the reverse bobbin work, I used DMC embroidery floss and wound it by hand on a bobbin and loaded it into my machine without changing any settings. Don't be afraid...just do it...it'll be okay. Working from the back of the blouse, I stitched along the seam line of the bib of the tunic so the bobbin thread would show on the front. It's as easy as that. It's subtle but isn't it pretty? I also added some to the band of the sleeve. Once you get going it's hard to stop. And yes, reverse bobbin work washes well. I ended up shortening the blouse 4" (I found it longer than the drawing suggests) but otherwise made no other changes. I will probably make it again this fall in a cozy flannel. Wouldn't it be great? But right now I'll enjoy my new sunny blouse. Have you made a Tova? 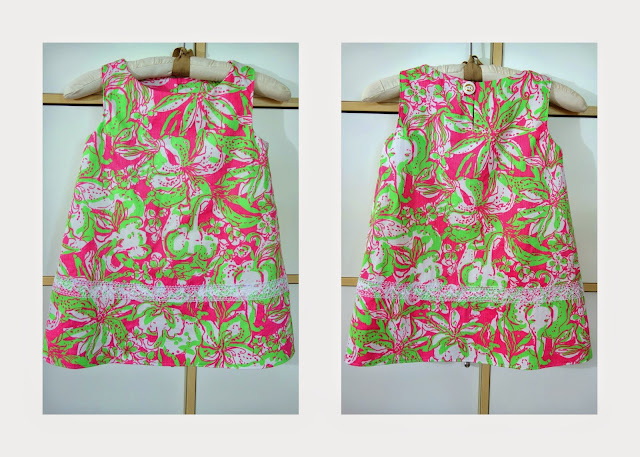 Made by a Fabricista: Lilly Inspired Mommy and Me Dresses! A little while back, Fabric Mart had the most adorable elephant printed cotton fabric available, and even though I wasn't 100% sure of what I wanted to make with it, I figured it would go fast, so I took a chance and purchased three yards of it, knowing I could likely make three yards work for something! Well it turns out, upon doing research with Mr. Google and Miss Pinterest, that I happened to have bought actual Lilly Pulitzer fabric from Fabric Mart, or if it isn't actual fabric from them, it is a darn good duplicate. 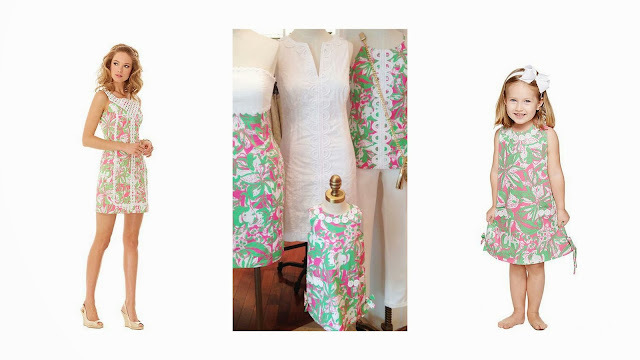 Above you see some items from Lilly Pulitzer's 2014 summer line! And, yep, those look an awful lot like the dresses I sewed up! My biggest proof, though? This pin from Pinterest which shows the fabric close up. It was pinned by none other than the folks at Lilly Pulitzer. The fabric was named "Forgot My Trunks," lol. So yahoo! I ended up with fabric from my favorite fabric store that made my dream of making mommy and me Lilly Pulitzer dresses a reality, literally! (And, psst, it looks like something *like* "Roar of the Jungle" is available at Fabric Mart right now, too, but only a few yards remain.) Sorry, sold out now! So what to do with the fabric and how could I make it look super "Lilly?" Well, I knew I would have to do a shift dress of some sort, and definitely had to use a crochet lace trim, since so many of her dresses feature that kind of detail. I had some of this trim in my stash, and it was the exact right shade of white to perfectly work with this fabric. I knew that I wanted the dress's trim to be placed on the center of the dress, in a vertical fashion, and though I could have eyeballed placing the trim down the center had there not been a center front vertical seam, I was glad I decided to go with a vintage pattern that had the seam there as it made placing the lace trim much easier (which I will show you more of down below). I also liked this pattern (McCall's 2148--circa 1969) since it featured a front button placket. Though I slightly lowered the neckline and did away with the buttons, having that feature already integrated in the pattern made adjusting for the split neckline design detail much easier, too. I own only one "Lilly" dress and I have to say, my sewn version looks really close in style to what I have seen out there from her over the years, especially from her beginnings, when her hemline choices were a bit longer (they are super short today, especially for the women's line), and she featured more of a classic shift shape as opposed to some of her current pieces, which hug the body's curves more. In fact, they only way I ended up getting my Lilly dress was from a consignment store, since most of the time Lilly dresses are too loose at the bust and too tight at the hips. The consignment store owner and I speculated that the size 10 dress I purchased had been altered at the shoulders and bust since all of the women who came in the shop and tried the dress on couldn't wear it because it was too tight at the bodice, when the size 10 normally fits them well. More than likely, someone with my pear shape purchased the right size for her hips, but paid someone to fix the bodice to better fit her smaller upper body. :-) Well, turns out I can do that too with sewing my own garments! I love how this dress fits, just enough give to be comfortable, but fitted enough to show off a bit of my shape. I do like the dresses that came in this fabric, but ooh, boy, they seem very fitted and very short, and I am just not comfortable doing that, and I never have been. The one place I did let loose a bit was at this split neckline. It is a bit lower than I usually wear, and because of that, I need to wear a camisole for modesty, but it is just a peekaboo, so really, no big deal. I love how the lace looks with the split neckline. I wasn't sure how it was going to turn out, I was really concerned it would look to "becky home-ecky," but in the end, I think it looks close enough to the "real thing" that the trim is more successful. It also helps that the trim is a bit thicker (1.5 inches width) and made from cotton crochet lace, which is less transparent than other lacy trims out there. The trim was a bit time consuming though. I placed it, by hand, and with pins, up and down the center seam, with one edge of the trim abutting the center seam. I then sewed the edge closest to the seam as close to the threading of the trim as possible. I then sewed the middle floral decoration bit, and I finished up by sewing the other edge of the trim on the other side. So that makes for three full sewn vertical lines PER lace trim. There are two lace trims here, each on one side of the center seam. This makes for a total width of three inches across, which gives the front of the dress some presence and makes the dress look more interesting. Though my ultimate goal was to get a photo of my daughter and I wearing the dresses, I couldn't resist my youngest son's desire to be in a photo, so here he is, posing with me for a photo. So here is my daughter on her own posing in her new dress. For her dress, I chose to use one of the patterns in my stash that she is on the edge of outgrowing, Butterick 5876, which goes from size 1-6. My daughter can wear a size 6 very easily, but often the length is too short, so I will have to size up to a 7. This time that happened, but because of the shape of the dress and the season, it's okay that it is a touch shorter than her other dresses. We will probably let her wear it with leggings to church, too. 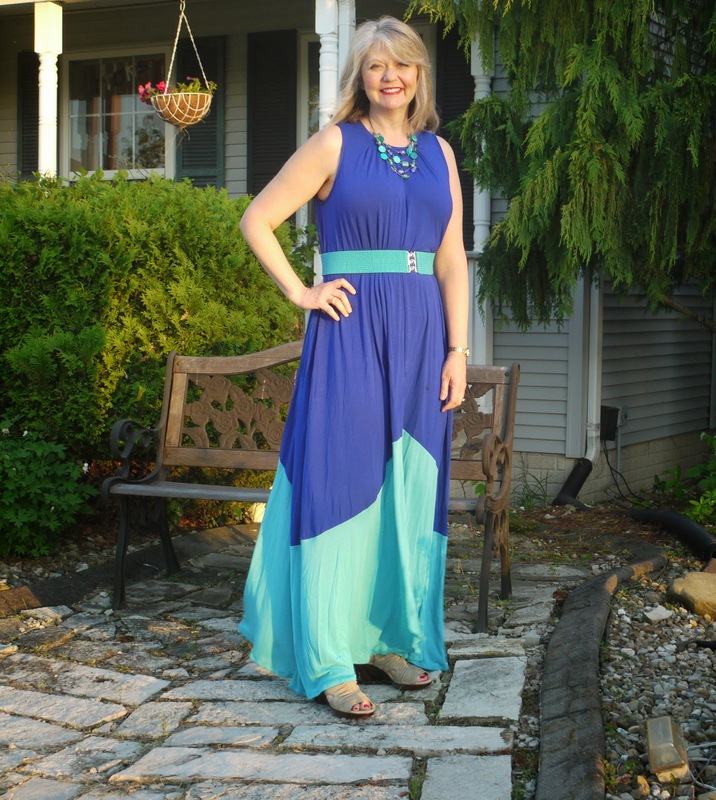 I chose this dress because it had a built in place for the crochet trim embellishment, at the junction between the border hem and the main part of the dress. Though I didn't end up doing the border hem detail, I was able to use that seam line to mark where the trim should be placed, and it ended up being perfect! I may love her dress more than mine! Here is the front and back views of the dress on its own. This dress took far less time to sew up than mine since I chose to sew up the side seams with the serger, and there were no back or front center seams to sew, either. The trim still took time, though, since I had to sew three times per trim (and like mine there were two trim treatments, one for the front, one for the back). 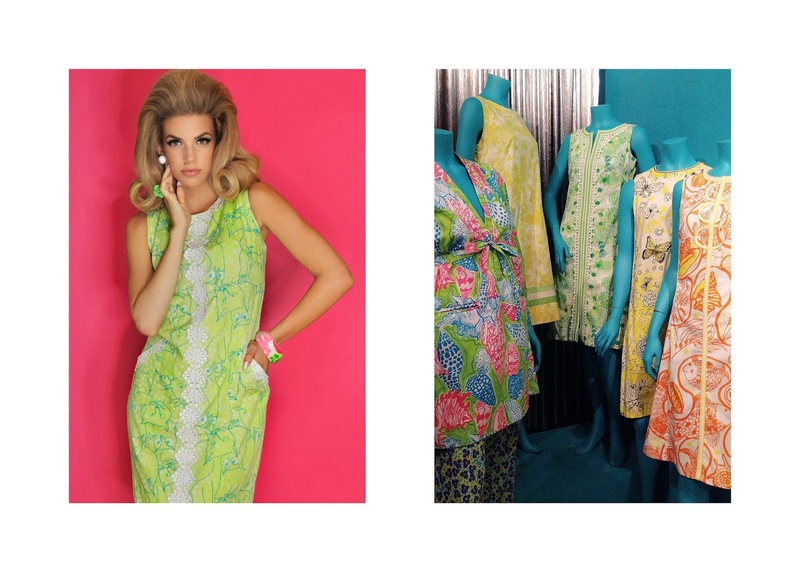 And just in case this inspired you to try it for yourself, above are some vintage Lilly Pulitzer dresses that I found while doing my research. I already feel inspired to try another set of dresses soon! Made by a Fabricista: Mommy and Me Time Rompers! Mothers Day -- There is nothing better than being able to share your craft with the ones you love. My daughter, Jordan (10 years old) has had very minimal interest in sewing these past years. While I have made her several garments in the past, her desire to learn was minimal at best. Attempts in the past yielded a good hour of attention. I have been planning on re-introducing her to sewing with some fun summer projects. My daughter loves summer dresses, shorts, colors! I used a hot pink/coral red/beige/white abstract print poly/lycra Charmeuse found (HERE). While I typically don't lean towards pink garments, I fell absolutely in love with this print! My daughters pattern is New Look S0814. We opted for a mix between view D and view C. I created view A of this pattern just last week and she wore it to her summer concert at school. I believe her love for the dress sparked her wanting to sew this time around. My daughter constructed 95% of her garment. I assisted only with the attachment of the flounce and the final hemming. I am so proud and could not stop smiling! She could not wait to wear her romper to school the next day! 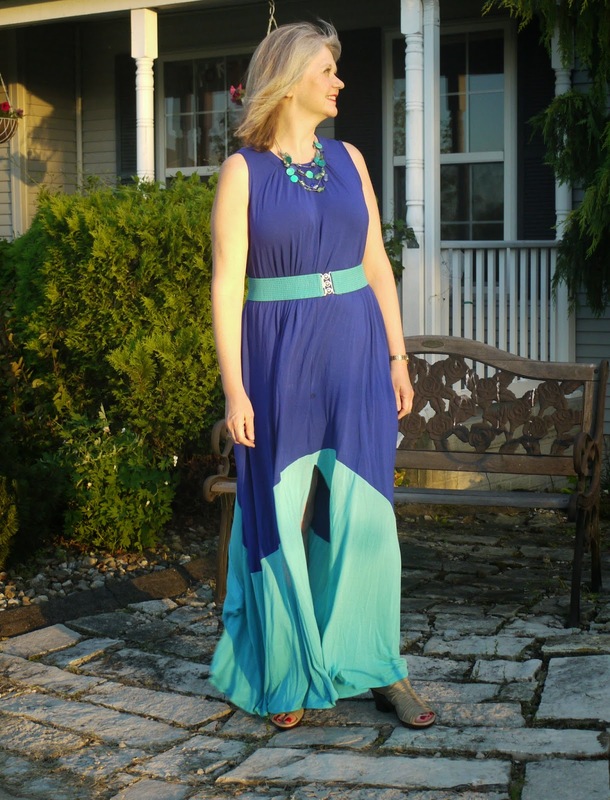 My romper was created using a mix of McCall 6848 (bottom) which is my go to for my romper bottoms and Vogue 9085. I made several adjustments to the pattern to accomplish the look I received. First, I cut the pattern 2 inches below the waistband (should I create this pattern again, I will likely double this measurement). Second, I cut lengthened the center front facing to run the length of the shirt. I then attached the facing right sides together, then encased the facing for my next step which was the adding of button holes. The first button hole was placed 6 inches from the next line and every 2 inches after. I then created a 48 inch spaghetti strap for the enclosure. The sleeves were constructed as per the pattern, but the sleeve casing was omitted and replaced with a hem and 1/4 inch elastic of which I used at the waist as well. My daughter assisted me though this construction by serging and inserting the elastic. I must say, it was a great Mother's Day! My silly bean :). Happy Sewing All!